The prospect of using biocatalysis for the production of energy has great potential due to its cost-effectiveness, the fact that it does not require a limited resource such as oil, and its potential universality of application and use globally. 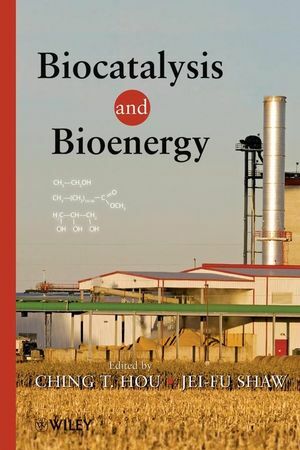 This is the definitive reference for biochemists and biochemical engineers, bioprocess and bioenergy scientists, physical and oil chemists (oleochemists), microbiologists, industrial microbiologists, molecular biologists, metabolic engineers working in biocatalysis, bioethanol, and biodiesel fuels, DOE scientists working on renewable energy, and other professionals in related fields. CHING T. HOU, PhD, is lead scientist at the USDA National Center for Agricultural Utilization Research in Peoria, Illinois. He has also worked as director of the Department of Microbial Biochemistry and Genetics at the Squibb Institute for Medical Research; a principal investigator and group leader at Exxon; and a National Research Council research associate at the USDA. He is a Fellow of the American Academy of Microbiology, the Society for Industrial Microbiology, and the American Oil Chemists' Society, holds seventeen patents, and has published four books. JEI-FU SHAW, PhD, is President and Chair Professor of National Chung Hsing University, Taichung, Taiwan. He has also worked as the director of the Institute of Botany, Academia Sinica; the director of the Institute of Biotechnology, National Taiwan Ocean University; and a distinguished professor of the National Science Council, Taiwan. Dr. Shaw received the Biotechnology Lifetime Achievement Award of the American Oil Chemists' Society in 2005 and was elected as a Fellow of the American Association for the Advancement of Science (AAAS) in 2006. He has published over 140 international SCI papers and holds seven patents. Chapter 1. Biodiesel Research at NCAUR, USDA (Sevim Erhan). Chapter 2. Enzymatic Reactions for Production of Biodiesel Fuel and Their Application to Oil and Fat Industry (Yuji Shimada, Yomi Watanabe, and Toshihiro Nagao). Chapter 3. Biodiesel cost optimizer-least cost raw material blending for "Standard" quality biodiesel (Ignace Debruyne). Chapter 4. New catalytic systems for vegetable oil transesterification based on tin compounds (Paulo A. Z. Suarez*, Joel C. Rubim and Melquizedeque B. Alves). Chapter 5. Noncatalytic Alcoholysis of Vegetable Oils for Production of Biodiesel Fuel (Hiroshi Nabetani, Mitsutoshi Nakajima, Shoji Hagiwara, Rie Yamazaki, and Hitoshi Maeda). Chapter 6. Improvements to the Biodiesel Batch Process and Impact on Low Temperature Performances (Franz Luxem, Stepan Company). Chapter 7. Development of New Products from Biodiesel Glycerin (Ronald Alan Holser). Chapter 8. Industrial Products from Biodiesel Glycerols (Richard D. Ashby, Victor T. Wyatt, Thomas A. Foglia and Daniel K. Y. Solaiman). Chapter 9. Optimization of Lipase-Catalyzed Biodiesel by Statistical Approach (Chee-Shan Chen, Jiann-Yih Jeng, Hen-Yi Ju, and Chwen-Jen Shieh). Chapter 10. Production of biofuel from lipids and alternative resources (R. Verhé1, V. Van Hoed1, C. Echim1, C. Stevens1, W. De Greyt, and M. Kellens). Chapter 11. Biotechnology of Holocellulose-Degrading Enzymes (Jürgen Andreausa, Edivaldo Ximenes Ferreira Filhob, and Elba Pinto da Silva Bonc). Chapter 12. From biogas energy to keratinase technology (Jason C.H. Shih, and Jeng-Jie Wang). Chapter 13. Emerging Technologies in dry grind ethanol production (Vijay Singh). Chapter 14. Gram positive bacteria as biocatalysts to convert biomass-derived sugars into biofuel and chemicals (Siqing Liu and Mike Cotta). Chapter 15. Biological Hydrogen Production by Strict Anaerobic Bacteria: Fundamentals, Strategies to Operation, and Limitations (Shihwu Sung and Wen-Hsing Chen). (C). Biocatalysis (Products from Renewable Resources). Chapter 16. Some Properties of a Self-sufficient Cytochrome P-450 monooxygenase system from Bacillus megaterium strain ALA2 (Brian L. Hilker, Herotada Fukushige, Ching T. Hou1 and David Hildebrand). Chapter 17. Biocatalysis-based development of oligosaccharides in Japan (Hajime Taniguchi). Chapter 18. Biocatalysis: Synthesis of chiral intermediates for drugs (Ramesh Patel). Chapter 19. Screening of novel microbial enzymes and their application to chiral compound Production (Michihiko Kataoka and Sakayu Shimizu). Chapter 20. Hydrogenation Technologies for the Production of High Quantity of Biobeneficiary Conjugated Fatty Acids (Mun Yhung Jung and Suk Hoo Yoon ). Chapter 21. Biotechnology of Mannitol Production (Badal Saha). Chapter 22. Physiological function of DHA phospholipids (Teruyoshi Yanagita, Bungo Shirouchi, koji Nagao, and Nao Inoue). Chapter 23. Conversion of fisheries by-products and waste into value-added products –Attempts undergoing in Hokkaido, Japan (Koretaro Takahashi and Kenji Fykunaga). Chapter 24. Chemo-enzymatic synthesis of structured lipids (Gudmundur G. Haraldsson). Chapter 25. Biosynthesis of Castor Oil Studied by the Regiospecific Analysis of Castor Triacylglycerols by ESI-MS (Jiann-Tsyh Lin). Chapter 26. Composition, Functionality and Potential Applications of Seaweed Lipids (Bhaskar Narayan1, Chandini S. Kumar1, Tokutake Sashima, Hayato Maeda, Masashi Hosokawa and Kazuo Miyashita). Chapter 27. Enzymatic production of marine-derived protein hydrolysates and their bioactive peptides for use in foods and nutraceuticals (Tomoko OKADA, Masashi HOSOKAWA, Seigo ONO, and Kazuo Miyashita). Chapter 28. Bioengineering and Application of Glucose Polymers (Kayo Hosoya, Iwao Kojima and Takeshi Takaha). Chapter 29. Peroxidase-Catalyzed Polymerization of Phenolic Compounds Containing Carbohydrate Residues (Hirofumi Nakano). Chapter 30. Production of lipase and oxygenated fatty acids from vegetable oils (Beom Soo Kim, Byung-Seob Song, and Ching T. Hou). Chapter 31. Production of Biologically Active Hydroxy Fatty Acids by Pseudomonas aeruginosa PR3 (Hak-Ryul Kim, Jae-Han Bae, Ching T. Hou, and Sun-Chul Kang). Chapter 32. Biotransformation of oils to value-added compounds (Milan Certik).